How I spent my weekend--In style. So for now, I'd like to share with you how I spent the past weekend. Had a mini reunion with my Mom's side--the Aguirre clan. 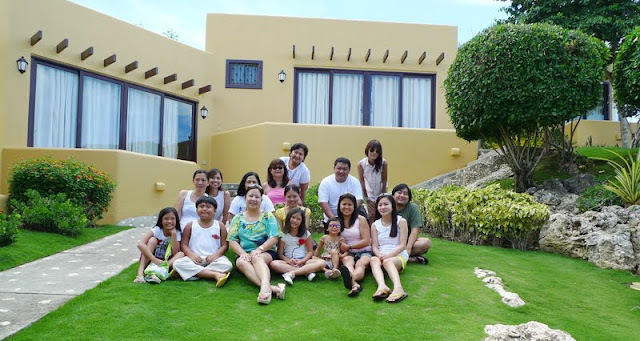 We flew to Bacolod then went to my Aunt's resthouse at Cauayan, Negros Occidental. Here's how it went in photos! Excessive airconing by Cebu Pacific. There you go. A clearer photo of me and my sister. It kind of reminds me of Santorini, Greece. Family room. Love how the beds were arranged! And what's for lunch? A lot!!! ... beautiful view + delicious food=perfection. After lunch we then headed to our assigned room. It's fantastic. The beds are super cozy. I heard my Aunt trained her staff to a hotel/spa school. Wow. Awesome bathroom! I love the Mexican inspired sink! Jetski lessons from Manong Irvin. Then tried it out on my own! My 2 layer egg and cheese pimiento sandwich. Takaw. After a few hours.. it's dinner time!!! And some night swimming. ..and then some late night snack. ... i love that there's unlimited soda! 2 little mice named Pax and Tricia. Lol. We woke up early to be able to go to the sandbar. It's a secluded spot in the middle of the ocean where we could snorkel. We had to ride my aunt's tagboat to go there. Yep, that's my sister smiling. The entire house from below. Nice. Our little princess Zoe trying out the jetski. Hehe. The sandbar. Too bad there were other people when we got there. Group pic before getting off the boat. It was really not a good place to snorkel at that time coz there were no fishes. I got bored so I got on the jetski again. Sayang eh may bayad to sa Boracay! Lol. Of course, we can't leave without taking a family picture...class picture style. wow.. beautiful place, beach and house!! i love it!!! and neverending food within the beach area? my idea of paradise. hahahaha! :D looks like you had so much fun!!! super love sis... is this exclusive lang for your family or do they actually accept guests here? really nice!